Medic 121 is a 2017, 5500 Series 4x4 Dodge/Horton, Type-1 ambulance. Medic 121 is an Advanced Life Support Unit which is equipped with the most up to date emergency patient care equipment. Among the patient care equipment carried on Medic 121 is the Physio Control LifePak 15, C-Pap equipment and a CO poisoning detection kit. The medic is also equipped with a Lucas CPR device. The medic crew is aided in finding addresses by the MECC map system on the trucks MDC. The mapping system was developed by a Plain Township Firefighter. The MECC map system is activated by the onboard MDC. This system shows street maps of Franklin and surrounding counties as well as hydrant locations. Medic 122 is a 2015, 5500 Series 4x4 Dodge/Horton, Type-1 ambulance. Medic 122 is an Advanced Life Support Unit which is equipped with the most up to date emergency patient care equipment. Among the patient care equipment carried on Medic 122 is the Physio Control LifePak 15, C-Pap equipment and a CO poisoning detection kit. The medic is also equipped with a Lucas CPR device. 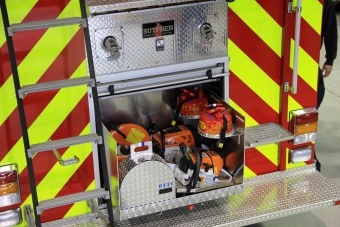 E121 is a 2010 Sutphen Monarch Engine with an Aluminum Rescue body. The truck carries 750 gallons of water and 40 gallons of Class A foam. It has a Darley LDMBC 1750 GPM pump with a compressed air foam system. 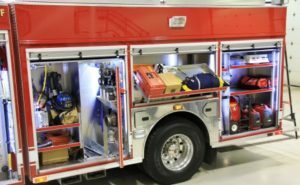 The truck is powered by a 450 HP Cummins ISM engine with a 20-kw hydraulic generator to power rescue tools and a 9000 watt command light tower. The truck has seating for four firefighters. 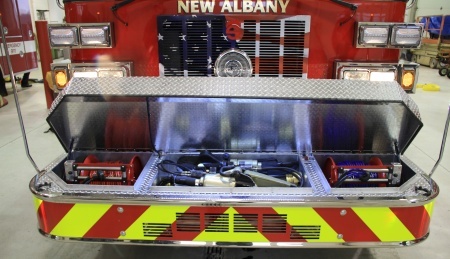 The engine can run as an ALS first responder equipped with a Lifepack 15. The rescue has a full complement of rescue equipment such as Gensis Hydraulic tools, water and rope rescue and shoring. 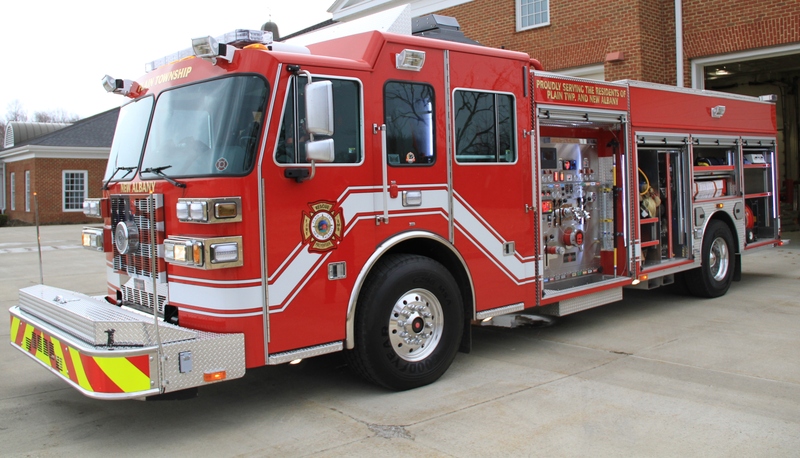 Engine 122 is a 2002 HME – Central States rescue body. The truck carries 750 gallons of water and a 1500 g.p.m. Hale Q Max pump. The engine was recently upgraded and now is equipped with a CAFS foam system and carries 30 gallons of foam. The body was custom made by Central States and was fabricated with 12 gauge stainless steel. Engine 122 is powered by a 400 h.p. Cummins ISM engine. The cab of Engine 122 is aluminum and seats a crew of 4 firefighters. The engine can run as a BLS response and is equipped with an AED defibrillator. Engine 122 also carries assorted other equipment such as airbags, Genesis rescue tools, Hi Lift jacks, and thermal imaging cameras. 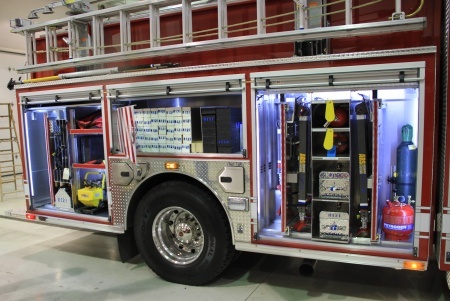 Engine 122’s main hand lines are located in the front bumper. All discharges on Engine 122 are color coded. The hoses in the front cross-lays are color coordinated between the handle and the hose. 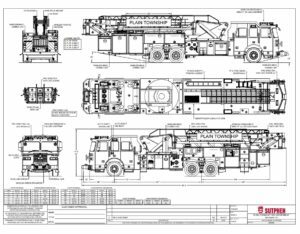 Engine 122 carries 250 feet of 1 ¾ inch hose in each cross-lay. 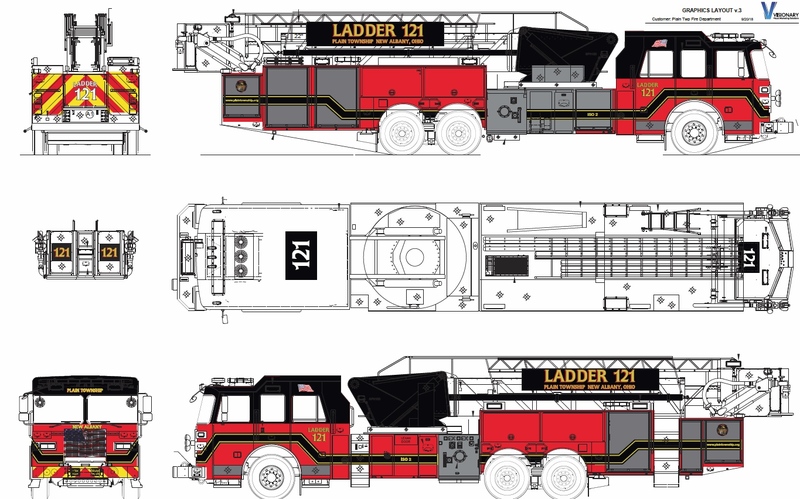 Ladder121 is a 1996 Sutphen 100 foot tower ladder. Ladder121 is powered by a 450 hp 8V 92 Detroit Diesel. 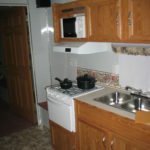 L-121 has a 1500 g.p.m. pump and a 300 gallon water tank. The ladder is pre piped with a 3inch extendable pipe connected to 2 water monitors on the bucket. The cab of Ladder 121 has seating for 5 firefighters. 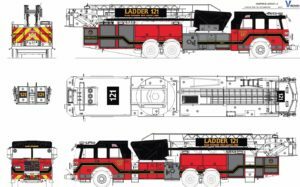 Ladder121 carries a multitude of equipment used in ladder operations such as ladders, hand tools, pike poles, axes, tarps, 3 PPV fans, 1 smoke ejector fan, thermal imaging camera, rope, salvage and overhaul supplies. 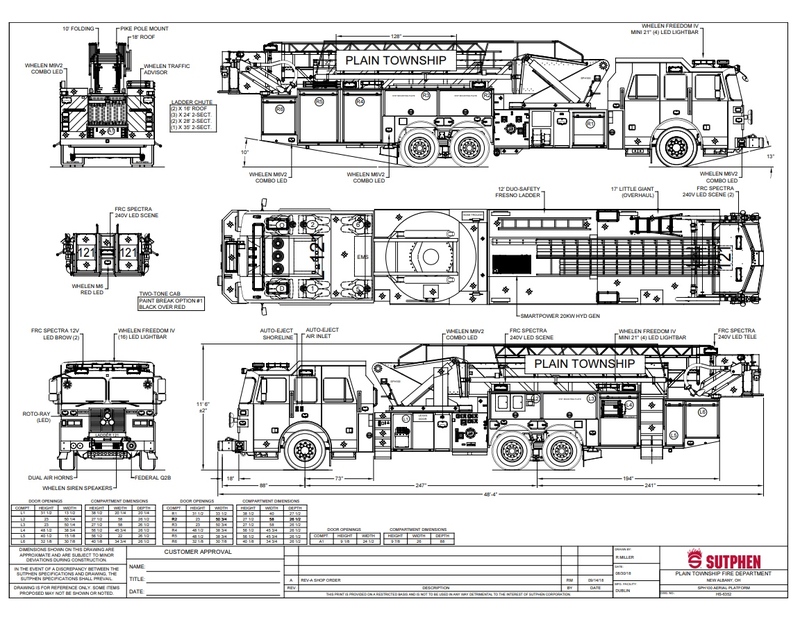 The Plain Township Fire Department will receive their new ladder this spring. It is expected to be placed in service the second quarter of 2019. 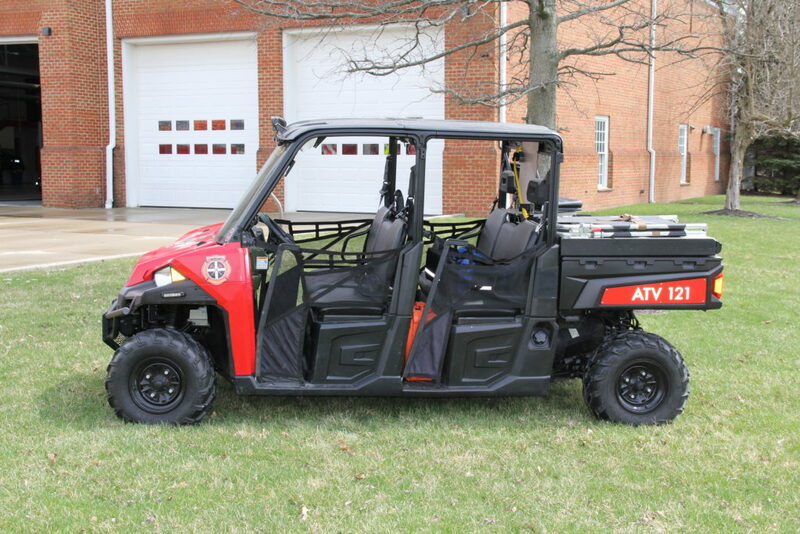 The Plain Township Fire Department Multi-purpose ATV can function as a medical transport, as well as, a support vehicle to transport equipment for the Central Ohio Strike Team. The unit was funded by a grant from Fire House Subs. 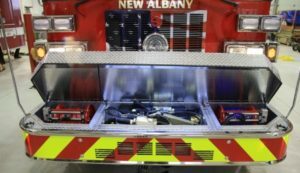 The Plain Township Trustees authorized the purchase of the fire safety house with help from the generous donations of the New Albany Realtors Association. 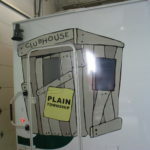 The purchase of the mobile fire safety house provides our firefighters with a “mobile classroom” featuring home-like rooms and realistic hazards. This creates an environment that gives people of all ages the knowledge they need to not only prevent fires, but the steps to follow to safely escape a fire. Education is a powerful tool in fighting fires and saving lives and the Plain Township Fire Department has a long standing reputation of being proactive in fire prevention. 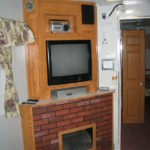 The programs that we use in our fire safety education lessons include home escape plans, fire safety precautions and instruction within the kitchen, living room, and bedroom. Lessons also include the proper way to report a fire to 9-1-1 and the appropriate safety steps when severe weather threatens, such as hurricanes, tornadoes, or earthquakes. Safety lessons include crawling low under smoke, exiting bedroom windows, the importance of functioning smoke alarms, and how to recognize fire hazards in the home. 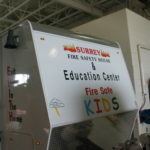 In addition to fire safety lessons at our elementary and high schools, we have the ability to reach out to the entire community – to daycare facilities, churches, safety fairs, and community events. 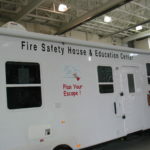 For more information on the Fire Safety House contact Fire Marshal Terry Guthrie at 614.855.7370.